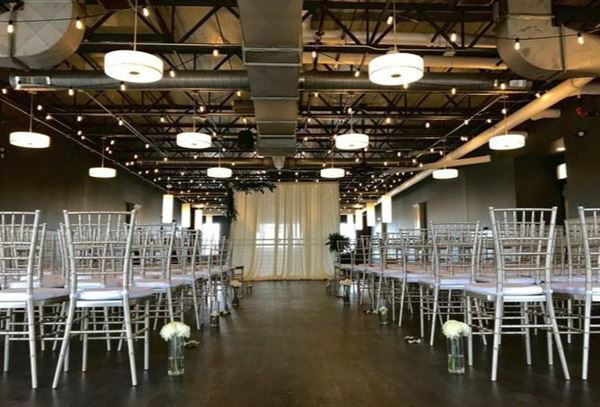 The District Venue is an elegant space that has been designed with countless amenities in order to create the perfect selection that fits any budget or style. We want you to be able to share your special moments with as many loved ones as you wish. Our beautifully structured venue hosts up to 350 guests for any wedding celebration, corporate party, or special event. The District Venue Room Rental Fee includes the following: • Time Block from 10am to 2am (16hr block) on your wedding day • 5,000 square feet of open space • Reception capacity for up to 350 guests • Event Coordinator • Free Wifi • Ample Parking • Elevator/Wheelchair Accessible Bathrooms • Tables • Chiavari Chairs • Your choice of black or white tablecloths & matching linen napkins • Chinaware • Flatware • Glassware • Full-Service Bar • Mixed cash and hosted options • Security/Dram Insurance • Room Set-Up • Free Tastings • In-House Catering • Wait Staff & Bartenders • Any Type of Food Service (Buffet, Family Style, or Plated) • Room Clean-Up & Teardown • Open Vendor Policy (with the exception of catering and alcohol) The cost to rent our full-service venue varies on the day of the week: • Friday: $3,500 • Saturday: $4,000 • Sunday: $1,500 *Holiday pricing upon request Please see attached PDFs for additional information and menu options.